Today is the start of the great oatmeal challenge. The Safeway currently has a special on Quaker Quick Oats for Just 4 U members–a whopping 42 oz. for $2.50. That’s a lot of oatmeal for not a lot of money, no? My goal is to see exactly how many breakfasts I can get out of that $2.50 canister. Note: This is the part where my mom, who I might add fed us oatmeal for breakfast for YEARS on end, turns up her nose and starts talking about how gross it is. She’s lucky we didn’t feel the same way. So, starting today, I will eat oatmeal every morning (work week morning, that is, since I keep the canister at work) until my supply runs out. Straight oatmeal for days on end might be a tall order, so I am planning on supplementing it with something to spice it up. Typically, I do a teaspoon of flax-seed (which gives it a nutty flavor) or some cinnamon with a splash of agave to sweeten it up. Today, I’m trying flax, strawberries, and agave. There is a whole list of ideas on the Quaker website. 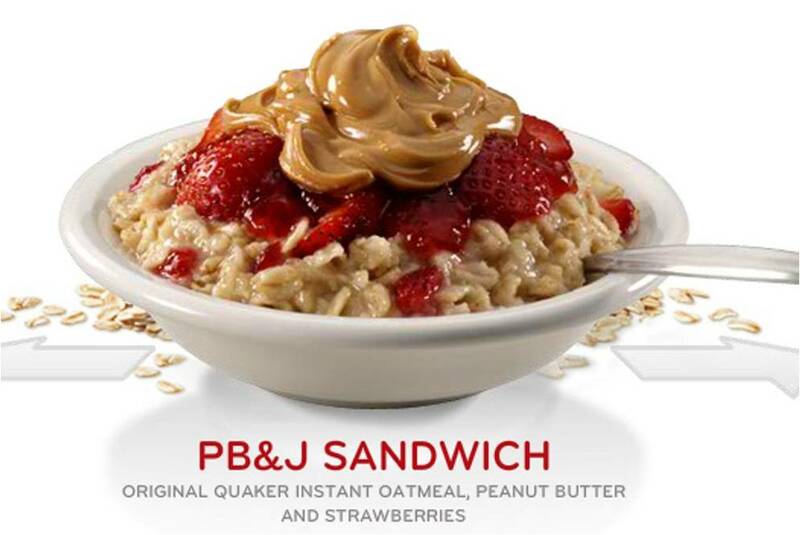 The PB&J recipe is a bit much (see below), but I’m sure there are others that I can tap into. Got any recipe ideas for me? Wish me luck! I wonder how long this is going to take. Anyone care to wager a bet? One of my favorite ways is to mix in a scoop of canned pumpkin – also not too expensive… delicious with a few seasonings for extra spice!! Just like pumpkin pie for breakfast!! Great idea! You could add cinnamon, nutmeg, and a little sweetener. It would be delicious! I have oatmeal every morning at work. It’s the best way to start the day. I like it with honey, blueberries or bananas. I purchase the packets, which is way more expensive. Maybe I’ll buy a canister the next time I run low and join you on your challenge.